Alternative medicine are generally practices that lack biological plausibility and are untested or untestable. In a few cases they are proven ineffective. Complementary medicine (CM), complementary and alternative medicine (CAM), integrated medicine or integrative medicine (IM), and holistic medicine are among many rebrandings of the same phenomenon. While the aim is to achieve the healing effects of medicine, alternative therapies share in common that they reside outside medical science, and rely on pseudoscience. The alternative is distinct from the experimental, which employs scientific method to test plausible therapies by way of responsible and ethical clinical trials, producing evidence of either effect or of no effect. Research into alternative treatments often fails to follow proper research protocol and denies calculalaton of prior probability, providing invalid results. Traditional practices become "alternative" when used outside their original settings without proper scientific explanation and evidence. Frequently used derogatory terms for the alternative are new-age or pseudo, with little distinction from quackery. In some cases, laws of nature are violated by the claims of alternative practices; in others the practice is plausibly effective but so dangerous to the patient that any use is unethical. Alternative practices often resort to the supernatural or superstitious to explain their effect, and range from ineffective to harmful and toxic. Much of the perceived effect of an alternative practice arises from a belief that it will be effective (placebo effect), or from the treated condition resolving on its own (the natural course of disease). This is further exacerbated by how alternative treatments are most often turned to upon the failure of medicine. At this point the condition will be at its worst and most likely to spontaneously improve. In diseases that don't tend to get better by themselves, such as cancer or HIV, multiple studies have shown significantly worse outcomes if patients turn to alternative therapies. While this may be because advanced disease causes patients to lose hope in medicine, it has also been shown that some alternative treatments actively interfere with medicine. The alternative sector is a highly profitable industry with a strong lobby. Often juxtaposed to the derided "big pharma", the alternative-industry profits from less regulation and is allowed to promote practices which are proven to have no effect. Despite many countries having laws against marketing or promoting alternative therapies for many conditions, there is active promotion of use in cancer, autoimmune disease, infectious disease and among children. Billions of dollars have been spent studying the "alternative", with little to no positive results. Some of the successful practices are only considered alternative under very specific definitions, such as those which include all physical activity under the umbrella of "alternative medicine". In General Guidelines for Methodologies on Research and Evaluation of Traditional Medicine, published in 2000 by the World Health Organization (WHO), complementary and alternative medicine were defined as a broad set of health care practices that are not part of that country's own tradition and are not integrated into the dominant health care system. The terms alternative medicine, complementary medicine, integrative medicine, holistic medicine, natural medicine, unorthodox medicine, fringe medicine, unconventional medicine, and new age medicine are used interchangeably as having the same meaning and are almost synonymous in most contexts. The meaning of the term "alternative" in the expression "alternative medicine", is not that it is an effective alternative to medical science, although some alternative medicine promoters may use the loose terminology to give the appearance of effectiveness. Loose terminology may also be used to suggest meaning that a dichotomy exists when it does not, e.g., the use of the expressions "western medicine" and "eastern medicine" to suggest that the difference is a cultural difference between the Asiatic east and the European west, rather than that the difference is between evidence-based medicine and treatments that do not work. CAM is an abbreviation of the phrase complementary and alternative medicine. It has also been called sCAM or SCAM with the addition of "so-called" or "supplements". The words balance and holism are often used, claiming to take into account a "whole" person, in contrast to the alleged reductionism of conventional medicine. Due to its many names the field has been criticized for intense rebranding of what are essentially the same practices. Besides the usual issues with alternative medicine, integrative medicine has been described by its critics as an attempt to bring pseudoscience into academic science-based medicine, leading to the pejorative term "quackademic medicine". Traditional medicine refers to the pre-scientific practices of a certain culture, contrary to what is typically practiced in other cultures where medical science dominates. "Eastern medicine" typically refers to the traditional medicines of Asia where conventional bio-medicine penetrated much later. The words balance and holism are often used alongside complementary or integrative medicine, claiming to take into account a "whole" person, in contrast to the supposed reductionism of medicine. Due to its many names the field has been criticized for intense rebranding of what are essentially the same practices. Prominent members of the science and biomedical science community say that it is not meaningful to define an alternative medicine that is separate from a conventional medicine, that the expressions "conventional medicine", "alternative medicine", "complementary medicine", "integrative medicine", and "holistic medicine" do not refer to any medicine at all. Others in both the biomedical and CAM communities say that CAM cannot be precisely defined because of the diversity of theories and practices it includes, and because the boundaries between CAM and biomedicine overlap, are porous, and change. The expression "complementary and alternative medicine" (CAM) resists easy definition because the health systems and practices it refers to are diffuse, and its boundaries poorly defined. [n 8] Healthcare practices categorized as alternative may differ in their historical origin, theoretical basis, diagnostic technique, therapeutic practice and in their relationship to the medical mainstream. Some alternative therapies, including traditional Chinese medicine (TCM) and Ayurveda, have antique origins in East or South Asia and are entirely alternative medical systems; others, such as homeopathy and chiropractic, have origins in Europe or the United States and emerged in the eighteenth and nineteenth centuries. Some, such as osteopathy and chiropractic, employ manipulative physical methods of treatment; others, such as meditation and prayer, are based on mind-body interventions. Treatments considered alternative in one location may be considered conventional in another. Thus, chiropractic is not considered alternative in Denmark and likewise osteopathic medicine is no longer thought of as an alternative therapy in the United States. Critics say the expression is deceptive because it implies there is an effective alternative to science-based medicine, and that complementary is deceptive because it implies that the treatment increases the effectiveness of (complements) science-based medicine, while alternative medicines that have been tested nearly always have no measurable positive effect compared to a placebo. Some definitions seek to specify alternative medicine in terms of its social and political marginality to mainstream healthcare. This can refer to the lack of support that alternative therapies receive from the medical establishment and related bodies regarding access to research funding, sympathetic coverage in the medical press, or inclusion in the standard medical curriculum. In 1993, the British Medical Association (BMA), one among many professional organizations who have attempted to define alternative medicine, stated that it[n 10] referred to "...those forms of treatment which are not widely used by the conventional healthcare professions, and the skills of which are not taught as part of the undergraduate curriculum of conventional medical and paramedical healthcare courses". In a US context, an influential definition coined in 1993 by the Harvard-based physician, David M. Eisenberg, characterized alternative medicine "as interventions neither taught widely in medical schools nor generally available in US hospitals". These descriptive definitions are inadequate in the present-day when some conventional doctors offer alternative medical treatments and CAM introductory courses or modules can be offered as part of standard undergraduate medical training; alternative medicine is taught in more than 50 per cent of US medical schools and increasingly US health insurers are willing to provide reimbursement for CAM therapies. In 1999, 7.7% of US hospitals reported using some form of CAM therapy; this proportion had risen to 37.7% by 2008. The 1995 OAM conference definition, an expansion of Eisenberg's 1993 formulation, is silent regarding questions of the medical effectiveness of alternative therapies. Its proponents hold that it thus avoids relativism about differing forms of medical knowledge and, while it is an essentially political definition, this should not imply that the dominance of mainstream biomedicine is solely due to political forces. According to this definition, alternative and mainstream medicine can only be differentiated with reference to what is "intrinsic to the politically dominant health system of a particular society of culture". However, there is neither a reliable method to distinguish between cultures and subcultures, nor to attribute them as dominant or subordinate, nor any accepted criteria to determine the dominance of a cultural entity. If the culture of a politically dominant healthcare system is held to be equivalent to the perspectives of those charged with the medical management of leading healthcare institutions and programs, the definition fails to recognize the potential for division either within such an elite or between a healthcare elite and the wider population. This line of division has been subject to criticism, however, as not all forms of standard medical practice have adequately demonstrated evidence of benefit,[n 4] and it is also unlikely in most instances that conventional therapies, if proven to be ineffective, would ever be classified as CAM. Similarly, the public information website maintained by the National Health and Medical Research Council (NHMRC) of the Commonwealth of Australia uses the acronym "CAM" for a wide range of health care practices, therapies, procedures and devices not within the domain of conventional medicine. In the Australian context this is stated to include acupuncture; aromatherapy; chiropractic; homeopathy; massage; meditation and relaxation therapies; naturopathy; osteopathy; reflexology, traditional Chinese medicine; and the use of vitamin supplements. Treatments performed by therapists that are not authorized healthcare professionals. Treatments performed by authorized healthcare professionals, but those based on methods otherwise used mainly outside the healthcare system. People without a healthcare authorisation are [also] allowed to perform the treatments. Proponents of an evidence-base for medicine[n 12] such as the Cochrane Collaboration (founded in 1993 and from 2011 providing input for WHO resolutions) take a position that all systematic reviews of treatments, whether "mainstream" or "alternative", ought to be held to the current standards of scientific method. In a study titled Development and classification of an operational definition of complementary and alternative medicine for the Cochrane Collaboration (2011) it was proposed that indicators that a therapy is accepted include government licensing of practitioners, coverage by health insurance, statements of approval by government agencies, and recommendation as part of a practice guideline; and that if something is currently a standard, accepted therapy, then it is not likely to be widely considered as CAM. Alternative medicine consists of a wide range of health care practices, products, and therapies. The shared feature is a claim to heal that is not based on the scientific method. Alternative medicine practices are diverse in their foundations and methodologies. Alternative medicine practices may be classified by their cultural origins or by the types of beliefs upon which they are based. Methods may incorporate or be based on traditional medicinal practices of a particular culture, folk knowledge, superstition, spiritual beliefs, belief in supernatural energies (antiscience), pseudoscience, errors in reasoning, propaganda, fraud, new or different concepts of health and disease, and any bases other than being proven by scientific methods. Different cultures may have their own unique traditional or belief based practices developed recently or over thousands of years, and specific practices or entire systems of practices. Alternative medicine, such as using naturopathy or homeopathy in place of conventional medicine, is based on belief systems not grounded in science. A belief that a substance that causes the symptoms of a disease in healthy people cures similar symptoms in sick people. [n 13] Developed before knowledge of atoms and molecules, or of basic chemistry, which shows that repeated dilution as practiced in homeopathy produces only water, and that homeopathy is not scientifically valid. "They told me if I took 1000 pills at night I should be quite another thing in the morning", an early 19th-century satire on Morison's Vegetable Pills, an alternative medicine supplement. Alternative medical systems may be based on traditional medicine practices, such as traditional Chinese medicine (TCM), Ayurveda in India, or practices of other cultures around the world. Some useful applications of traditional medicines have been researched and accepted within ordinary medicine, however the underlying belief systems are seldom scientific and are not accepted. Traditional medicine is considered alternative when it is used outside its home region; or when it is used together with or instead of known functional treatment; or when it can be reasonably expected that the patient or practitioner knows or should know that it will not work – such as knowing that the practice is based on superstition. Traditional Chinese medicine Traditional practices and beliefs from China, together with modifications made by the Communist party make up TCM. 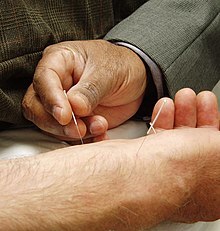 Common practices include herbal medicine, acupuncture (insertion of needles in the body at specified points), massage (Tui na), exercise (qigong), and dietary therapy. The practices are based on belief in a supernatural energy called qi, considerations of Chinese Astrology and Chinese numerology, traditional use of herbs and other substances found in China – a belief that the tongue contains a map of the body that reflects changes in the body, and an incorrect model of the anatomy and physiology of internal organs. Ayurveda Traditional medicine of India. Ayurveda believes in the existence of three elemental substances, the doshas (called Vata, Pitta and Kapha), and states that a balance of the doshas results in health, while imbalance results in disease. Such disease-inducing imbalances can be adjusted and balanced using traditional herbs, minerals and heavy metals. Ayurveda stresses the use of plant-based medicines and treatments, with some animal products, and added minerals, including sulfur, arsenic, lead and copper sulfate[clarification needed]. Safety concerns have been raised about Ayurveda, with two U.S. studies finding about 20 percent of Ayurvedic Indian-manufactured patent medicines contained toxic levels of heavy metals such as lead, mercury and arsenic. A 2015 study of users in the United States also found elevated blood lead levels in 40 percent of those tested. Other concerns include the use of herbs containing toxic compounds and the lack of quality control in Ayurvedic facilities. Incidents of heavy metal poisoning have been attributed to the use of these compounds in the United States. Bases of belief may include belief in existence of supernatural energies undetected by the science of physics, as in biofields, or in belief in properties of the energies of physics that are inconsistent with the laws of physics, as in energy medicine. Biofield therapy Intended to influence energy fields that, it is purported, surround and penetrate the body. Writers such as noted astrophysicist and advocate of skeptical thinking (Scientific skepticism) Carl Sagan (1934–1996) have described the lack of empirical evidence to support the existence of the putative energy fields on which these therapies are predicated. Chiropractic Spinal manipulation aims to treat "vertebral subluxations" which are claimed to put pressure on nerves. Chiropractic was developed in the belief that manipulating the spine affects the flow of a supernatural vital energy and thereby affects health and disease. Vertebral subluxation is a pseudoscientific concept and has not been proven to exist. Reiki Practitioners place their palms on the patient near Chakras that they believe are centers of supernatural energies in the belief that these supernatural energies can transfer from the practitioner's palms to heal the patient. Lacks credible scientific evidence. Substance based practices use substances found in nature such as herbs, foods, non-vitamin supplements and megavitamins, animal and fungal products, and minerals, including use of these products in traditional medical practices that may also incorporate other methods. Examples include healing claims for nonvitamin supplements, fish oil, Omega-3 fatty acid, glucosamine, echinacea, flaxseed oil, and ginseng. Herbal medicine, or phytotherapy, includes not just the use of plant products, but may also include the use of animal and mineral products. It is among the most commercially successful branches of alternative medicine, and includes the tablets, powders and elixirs that are sold as "nutritional supplements". Only a very small percentage of these have been shown to have any efficacy, and there is little regulation as to standards and safety of their contents. This may include use of known toxic substances, such as use of the poison lead in traditional Chinese medicine. Christian faith healing There is a divine or spiritual intervention in healing. Lack of evidence for effectiveness. Unwanted outcomes, such as death and disability, "have occurred when faith healing was elected instead of medical care for serious injuries or illnesses". A 2001 double-blind study of 799 discharged coronary surgery patients found that "intercessory prayer had no significant effect on medical outcomes after hospitalization in a coronary care unit." A US agency, National Center on Complementary and Integrative Health (NCCIH), has created a classification system for branches of complementary and alternative medicine that divides them into five major groups. These groups have some overlap, and distinguish two types of energy medicine: veritable which involves scientifically observable energy (including magnet therapy, colorpuncture and light therapy) and putative, which invokes physically undetectable or unverifiable energy. None of these energies have any evidence to support that they effect the body in any positive or health promoting way. Whole medical systems: Cut across more than one of the other groups; examples include traditional Chinese medicine, naturopathy, homeopathy, and ayurveda. Mind-body interventions: Explore the interconnection between the mind, body, and spirit, under the premise that they affect "bodily functions and symptoms". A connection between mind and body is conventional medical fact, and this classification does not include therapies with proven function such as cognitive behavioral therapy. Manipulative and body-based practices: feature manipulation or movement of body parts, such as is done in bodywork, chiropractic, and osteopathic manipulation. Biofield therapies are intended to influence energy fields that are purported to surround and penetrate the body. The existence of such energy fields have been disproven. Bioelectromagnetic-based therapies use verifiable electromagnetic fields, such as pulsed fields, alternating-current, or direct-current fields in an non-scientific manner. The history of alternative medicine may refer to the history of a group of diverse medical practices that were collectively promoted as "alternative medicine" beginning in the 1970s, to the collection of individual histories of members of that group, or to the history of western medical practices that were labeled "irregular practices" by the western medical establishment. It includes the histories of complementary medicine and of integrative medicine. Before the 1970s, western practitioners that were not part of the increasingly science-based medical establishment were referred to "irregular practitioners", and were dismissed by the medical establishment as unscientific and as practicing quackery. Until the 1970s, irregular practice became increasingly marginalized as quackery and fraud, as western medicine increasingly incorporated scientific methods and discoveries, and had a corresponding increase in success of its treatments. In the 1970s, irregular practices were grouped with traditional practices of nonwestern cultures and with other unproven or disproven practices that were not part of biomedicine, with the entire group collectively marketed and promoted under the single expression "alternative medicine". Use of alternative medicine in the west began to rise following the counterculture movement of the 1960s, as part of the rising new age movement of the 1970s. This was due to misleading mass marketing of "alternative medicine" being an effective "alternative" to biomedicine, changing social attitudes about not using chemicals and challenging the establishment and authority of any kind, sensitivity to giving equal measure to beliefs and practices of other cultures (cultural relativism), and growing frustration and desperation by patients about limitations and side effects of science-based medicine. At the same time, in 1975, the American Medical Association, which played the central role in fighting quackery in the United States, abolished its quackery committee and closed down its Department of Investigation. :xxi By the early to mid 1970s the expression "alternative medicine" came into widespread use, and the expression became mass marketed as a collection of "natural" and effective treatment "alternatives" to science-based biomedicine. By 1983, mass marketing of "alternative medicine" was so pervasive that the British Medical Journal (BMJ) pointed to "an apparently endless stream of books, articles, and radio and television programmes urge on the public the virtues of (alternative medicine) treatments ranging from meditation to drilling a hole in the skull to let in more oxygen". Mainly as a result of reforms following the Flexner Report of 1910 medical education in established medical schools in the US has generally not included alternative medicine as a teaching topic. [n 15] Typically, their teaching is based on current practice and scientific knowledge about: anatomy, physiology, histology, embryology, neuroanatomy, pathology, pharmacology, microbiology and immunology. Medical schools' teaching includes such topics as doctor-patient communication, ethics, the art of medicine, and engaging in complex clinical reasoning (medical decision-making). Writing in 2002, Snyderman and Weil remarked that by the early twentieth century the Flexner model had helped to create the 20th-century academic health center, in which education, research, and practice were inseparable. While this had much improved medical practice by defining with increasing certainty the pathophysiological basis of disease, a single-minded focus on the pathophysiological had diverted much of mainstream American medicine from clinical conditions that were not well understood in mechanistic terms, and were not effectively treated by conventional therapies. By 2001 some form of CAM training was being offered by at least 75 out of 125 medical schools in the US. Exceptionally, the School of Medicine of the University of Maryland, Baltimore includes a research institute for integrative medicine (a member entity of the Cochrane Collaboration). Medical schools are responsible for conferring medical degrees, but a physician typically may not legally practice medicine until licensed by the local government authority. Licensed physicians in the US who have attended one of the established medical schools there have usually graduated Doctor of Medicine (MD). All states require that applicants for MD licensure be graduates of an approved medical school and complete the United States Medical Licensing Exam (USMLE). There is a general scientific consensus that alternative therapies lack the requisite scientific validation, and their effectiveness is either unproved or disproved. Many of the claims regarding the efficacy of alternative medicines are controversial, since research on them is frequently of low quality and methodologically flawed. Selective publication bias, marked differences in product quality and standardisation, and some companies making unsubstantiated claims call into question the claims of efficacy of isolated examples where there is evidence for alternative therapies. The Scientific Review of Alternative Medicine points to confusions in the general population – a person may attribute symptomatic relief to an otherwise-ineffective therapy just because they are taking something (the placebo effect); the natural recovery from or the cyclical nature of an illness (the regression fallacy) gets misattributed to an alternative medicine being taken; a person not diagnosed with science-based medicine may never originally have had a true illness diagnosed as an alternative disease category. Edzard Ernst characterized the evidence for many alternative techniques as weak, nonexistent, or negative and in 2011 published his estimate that about 7.4% were based on "sound evidence", although he believes that may be an overestimate. Ernst has concluded that 95% of the alternative treatments he and his team studied, including acupuncture, herbal medicine, homeopathy, and reflexology, are "statistically indistinguishable from placebo treatments", but he also believes there is something that conventional doctors can usefully learn from the chiropractors and homeopath: this is the therapeutic value of the placebo effect, one of the strangest phenomena in medicine. In 2003, a project funded by the CDC identified 208 condition-treatment pairs, of which 58% had been studied by at least one randomized controlled trial (RCT), and 23% had been assessed with a meta-analysis. According to a 2005 book by a US Institute of Medicine panel, the number of RCTs focused on CAM has risen dramatically. As of 2005[update], the Cochrane Library had 145 CAM-related Cochrane systematic reviews and 340 non-Cochrane systematic reviews. An analysis of the conclusions of only the 145 Cochrane reviews was done by two readers. In 83% of the cases, the readers agreed. In the 17% in which they disagreed, a third reader agreed with one of the initial readers to set a rating. These studies found that, for CAM, 38.4% concluded positive effect or possibly positive (12.4%), 4.8% concluded no effect, 0.7% concluded harmful effect, and 56.6% concluded insufficient evidence. An assessment of conventional treatments found that 41.3% concluded positive or possibly positive effect, 20% concluded no effect, 8.1% concluded net harmful effects, and 21.3% concluded insufficient evidence. However, the CAM review used the more developed 2004 Cochrane database, while the conventional review used the initial 1998 Cochrane database. In the same way as for conventional therapies, drugs, and interventions, it can be difficult to test the efficacy of alternative medicine in clinical trials. In instances where an established, effective, treatment for a condition is already available, the Helsinki Declaration states that withholding such treatment is unethical in most circumstances. Use of standard-of-care treatment in addition to an alternative technique being tested may produce confounded or difficult-to-interpret results. a) Misinterpreted natural course – the individual gets better without treatment. b) Placebo effect or false treatment effect – an individual receives "alternative therapy" and is convinced it will help. The conviction makes them more likely to get better. c) Nocebo effect – an individual is convinced that standard treatment will not work, and that alternative treatment will work. This decreases the likelihood standard treatment will work, while the placebo effect of the "alternative" remains. d) No adverse effects — Standard treatment is replaced with "alternative" treatment, getting rid of adverse effects, but also of improvement. e) Interference — Standard treatment is "complemented" with something that interferes with its effect. This can both cause worse effect, but also decreased (or even increased) side effects, which may be interpreted as "helping". Researchers such as epidemiologists, clinical statisticians and pharmacologists use clinical trials to tease out such effects, allowing doctors to offer only that which has been shown to work. "Alternative treatments" often refuse to use trials or make it deliberately hard to do so. A placebo is a medical treatment with no intended therapeutic value. An example of a placebo is an inert pill, but it can include more dramatic interventions like sham surgery. The placebo effect is the concept that patients will perceive an improvement after being treated with an inert treatment. The opposite of the placebo effect would be the nocebo effect, when patients who expect a treatment to be harmful will perceive harmful effects after taking it. Placebos do not have a physical effect on diseases or improve overall outcomes, but patients may report improvements in subjective outcomes such as pain and nausea. A 1955 study suggested that a substantial part of a medicine's impact was due to the placebo effect. The study was found to have flawed methodology in a 1997 reassessment. This and other modern reviews suggest that other factors like natural recovery and reporting bias should also be considered. All of these are reasons why alternative therapies may be credited for improving a patient's condition even though the objective effect is non-existent, or even harmful. David Gorski argues that alternatives treatments should be treated as a placebo, rather than as medicine. Almost none have performed significantly better than a placebo in clinical trials. Furthermore, distrust of conventional medicine may lead to patients experiencing the nocebo effect when taking effective medication. A patient who receives an inert treatment may report improvements afterwards that it did not cause. Assuming it was the cause without evidence is an example of the regression fallacy. This may be due to a natural recovery from the illness, or a fluctuation in the symptoms of a long-term condition. The concept of regression toward the mean implies that an extreme result is more likely to be followed by a less extreme result. There are also reasons why a placebo treatment group may outperform a "no-treatment" group in a test which are not related to a patient's experience. These include patients reporting more favourable results than they really felt due to "politeness" or "experimental subordination", observer bias and misleading wording of questions. In their 2010 systematic review of studies into placebos, Asbjørn Hróbjartsson and Peter C. Gøtzsche write that "even if there were no true effect of placebo, one would expect to record differences between placebo and no-treatment groups due to bias associated with lack of blinding." Practitioners of complementary medicine usually discuss and advise patients as to available alternative therapies. Patients often express interest in mind-body complementary therapies because they offer a non-drug approach to treating some health conditions. In addition to the social-cultural underpinnings of the popularity of alternative medicine, there are several psychological issues that are critical to its growth, notably psychological effects, such as the will to believe, cognitive biases that help maintain self-esteem and promote harmonious social functioning, and the post hoc, ergo propter hoc fallacy. Edzard Ernst, a leading authority on scientific study of alternative treatments and diagnoses, and the first university professor of Complementary and Alternative Medicine. Here in 2012, promoting his book Trick or Treatment co-written with Simon Singh. Paul Offit proposed that "alternative medicine becomes quackery" in four ways: by recommending against conventional therapies that are helpful, promoting potentially harmful therapies without adequate warning, draining patients' bank accounts, or by promoting "magical thinking." Authors have speculated on the socio-cultural and psychological reasons for the appeal of alternative medicines among the minority using them in lieu of conventional medicine. There are several socio-cultural reasons for the interest in these treatments centered on the low level of scientific literacy among the public at large and a concomitant increase in antiscientific attitudes and new age mysticism. Related to this are vigorous marketing of extravagant claims by the alternative medical community combined with inadequate media scrutiny and attacks on critics. There is also an increase in conspiracy theories toward conventional medicine and pharmaceutical companies, mistrust of traditional authority figures, such as the physician, and a dislike of the current delivery methods of scientific biomedicine, all of which have led patients to seek out alternative medicine to treat a variety of ailments. Many patients lack access to contemporary medicine, due to a lack of private or public health insurance, which leads them to seek out lower-cost alternative medicine. Medical doctors are also aggressively marketing alternative medicine to profit from this market. Patients can be averse to the painful, unpleasant, and sometimes-dangerous side effects of biomedical treatments. Treatments for severe diseases such as cancer and HIV infection have well-known, significant side-effects. Even low-risk medications such as antibiotics can have potential to cause life-threatening anaphylactic reactions in a very few individuals. Many medications may cause minor but bothersome symptoms such as cough or upset stomach. In all of these cases, patients may be seeking out alternative treatments to avoid the adverse effects of conventional treatments. According to recent research, the increasing popularity of the CAM needs to be explained by moral convictions or lifestyle choices rather than by economic reasoning. In developing nations, access to essential medicines is severely restricted by lack of resources and poverty. Traditional remedies, often closely resembling or forming the basis for alternative remedies, may comprise primary healthcare or be integrated into the healthcare system. In Africa, traditional medicine is used for 80% of primary healthcare, and in developing nations as a whole over one-third of the population lack access to essential medicines. Some have proposed adopting a prize system to reward medical research. However, public funding for research exists. In the US increasing the funding for research on alternative medicine is the purpose of the US National Center for Complementary and Alternative Medicine (NCCAM). NCCAM has spent more than US$2.5 billion on such research since 1992 and this research has not demonstrated the efficacy of alternative treatments. The NCCAM's sister organization in the NIC Office of Cancer Complementary and Alternative Medicine gives grants of around $105 million every year. That alternative medicine has been on the rise "in countries where Western science and scientific method generally are accepted as the major foundations for healthcare, and 'evidence-based' practice is the dominant paradigm" was described as an "enigma" in the Medical Journal of Australia. In the United States, the 1974 Child Abuse Prevention and Treatment Act (CAPTA) required that for states to receive federal money, they had to grant religious exemptions to child neglect and abuse laws regarding religion-based healing practices. Thirty-one states have child-abuse religious exemptions. The use of alternative medicine in the US has increased, with a 50 percent increase in expenditures and a 25 percent increase in the use of alternative therapies between 1990 and 1997 in America. Americans spend many billions on the therapies annually. Most Americans used CAM to treat and/or prevent musculoskeletal conditions or other conditions associated with chronic or recurring pain. In America, women were more likely than men to use CAM, with the biggest difference in use of mind-body therapies including prayer specifically for health reasons". In 2008, more than 37% of American hospitals offered alternative therapies, up from 27 percent in 2005, and 25% in 2004. More than 70% of the hospitals offering CAM were in urban areas. A survey of Americans found that 88 percent thought that "there are some good ways of treating sickness that medical science does not recognize". Use of magnets was the most common tool in energy medicine in America, and among users of it, 58 percent described it as at least "sort of scientific", when it is not at all scientific. In 2002, at least 60 percent of US medical schools have at least some class time spent teaching alternative therapies. "Therapeutic touch" was taught at more than 100 colleges and universities in 75 countries before the practice was debunked by a nine-year-old child for a school science project. In Britain, the most often used alternative therapies were Alexander technique, Aromatherapy, Bach and other flower remedies, Body work therapies including massage, Counseling stress therapies, hypnotherapy, Meditation, Reflexology, Shiatsu, Ayurvedic medicine, Nutritional medicine, and Yoga. Ayurvedic medicine remedies are mainly plant based with some use of animal materials. Safety concerns include the use of herbs containing toxic compounds and the lack of quality control in Ayurvedic facilities. According to the National Health Service (England), the most commonly used complementary and alternative medicines (CAM) supported by the NHS in the UK are: acupuncture, aromatherapy, chiropractic, homeopathy, massage, osteopathy and clinical hypnotherapy. Complementary therapies are often used in palliative care or by practitioners attempting to manage chronic pain in patients. Integrative medicine is considered more acceptable in the interdisciplinary approach used in palliative care than in other areas of medicine. "From its early experiences of care for the dying, palliative care took for granted the necessity of placing patient values and lifestyle habits at the core of any design and delivery of quality care at the end of life. If the patient desired complementary therapies, and as long as such treatments provided additional support and did not endanger the patient, they were considered acceptable." The non-pharmacologic interventions of complementary medicine can employ mind-body interventions designed to "reduce pain and concomitant mood disturbance and increase quality of life." In Austria and Germany complementary and alternative medicine is mainly in the hands of doctors with MDs, and half or more of the American alternative practitioners are licensed MDs. In Germany herbs are tightly regulated: half are prescribed by doctors and covered by health insurance. Some professions of complementary/traditional/alternative medicine, such as chiropractic, have achieved full regulation in North America and other parts of the world and are regulated in a manner similar to that governing science-based medicine. In contrast, other approaches may be partially recognized and others have no regulation at all. Regulation and licensing of alternative medicine ranges widely from country to country, and state to state. Government bodies in the US and elsewhere have published information or guidance about alternative medicine. The U.S. Food and Drug Administration (FDA), has issued online warnings for consumers about medication health fraud. This includes a section on Alternative Medicine Fraud, such as a warning that Ayurvedic products generally have not been approved by the FDA before marketing. Many of the claims regarding the safety and efficacy of alternative medicine are controversial. Some alternative treatments have been associated with unexpected side effects, which can be fatal. A commonly voiced concerns about complementary alternative medicine (CAM) is the way it's regulated. There have been significant developments in how CAMs should be assessed prior to re-sale in the United Kingdom and the European Union (EU) in the last 2 years. Despite this, it has been suggested that current regulatory bodies have been ineffective in preventing deception of patients as many companies have re-labelled their drugs to avoid the new laws. There is no general consensus about how to balance consumer protection (from false claims, toxicity, and advertising) with freedom to choose remedies. Advocates of CAM suggest that regulation of the industry will adversely affect patients looking for alternative ways to manage their symptoms, even if many of the benefits may represent the placebo affect. Some contend that alternative medicines should not require any more regulation than over-the-counter medicines that can also be toxic in overdose (such as paracetamol). Forms of alternative medicine that are biologically active can be dangerous even when used in conjunction with conventional medicine. Examples include immuno-augmentation therapy, shark cartilage, bioresonance therapy, oxygen and ozone therapies, and insulin potentiation therapy. Some herbal remedies can cause dangerous interactions with chemotherapy drugs, radiation therapy, or anesthetics during surgery, among other problems. An example of these dangers was reported by Associate Professor Alastair MacLennan of Adelaide University, Australia regarding a patient who almost bled to death on the operating table after neglecting to mention that she had been taking "natural" potions to "build up her strength" before the operation, including a powerful anticoagulant that nearly caused her death. And lastly there's the cynicism and disappointment and depression that some patients get from going on from one alternative medicine to the next, and they find after three months the placebo effect wears off, and they're disappointed and they move on to the next one, and they're disappointed and disillusioned, and that can create depression and make the eventual treatment of the patient with anything effective difficult, because you may not get compliance, because they've seen the failure so often in the past. Conventional treatments are subjected to testing for undesired side-effects, whereas alternative treatments, in general, are not subjected to such testing at all. Any treatment – whether conventional or alternative – that has a biological or psychological effect on a patient may also have potential to possess dangerous biological or psychological side-effects. Attempts to refute this fact with regard to alternative treatments sometimes use the appeal to nature fallacy, i.e., "That which is natural cannot be harmful." Specific groups of patients such as patients with impaired hepatic or renal function are more susceptible to side effects of alternative remedies. An exception to the normal thinking regarding side-effects is Homeopathy. Since 1938, the U.S. Food and Drug Administration (FDA) has regulated homeopathic products in "several significantly different ways from other drugs." Homeopathic preparations, termed "remedies", are extremely dilute, often far beyond the point where a single molecule of the original active (and possibly toxic) ingredient is likely to remain. They are, thus, considered safe on that count, but "their products are exempt from good manufacturing practice requirements related to expiration dating and from finished product testing for identity and strength", and their alcohol concentration may be much higher than allowed in conventional drugs. Those having experienced or perceived success with one alternative therapy for a minor ailment may be convinced of its efficacy and persuaded to extrapolate that success to some other alternative therapy for a more serious, possibly life-threatening illness. For this reason, critics argue that therapies that rely on the placebo effect to define success are very dangerous. According to mental health journalist Scott Lilienfeld in 2002, "unvalidated or scientifically unsupported mental health practices can lead individuals to forgo effective treatments" and refers to this as "opportunity cost". Individuals who spend large amounts of time and money on ineffective treatments may be left with precious little of either, and may forfeit the opportunity to obtain treatments that could be more helpful. In short, even innocuous treatments can indirectly produce negative outcomes. Between 2001 and 2003, four children died in Australia because their parents chose ineffective naturopathic, homeopathic, or other alternative medicines and diets rather than conventional therapies. There have always been "many therapies offered outside of conventional cancer treatment centers and based on theories not found in biomedicine. These alternative cancer cures have often been described as 'unproven,' suggesting that appropriate clinical trials have not been conducted and that the therapeutic value of the treatment is unknown." However, "many alternative cancer treatments have been investigated in good-quality clinical trials, and they have been shown to be ineffective....The label 'unproven' is inappropriate for such therapies; it is time to assert that many alternative cancer therapies have been 'disproven'." any alternative cancer cure is bogus by definition. There will never be an alternative cancer cure. Why? Because if something looked halfway promising, then mainstream oncology would scrutinize it, and if there is anything to it, it would become mainstream almost automatically and very quickly. All curative "alternative cancer cures" are based on false claims, are bogus, and, I would say, even criminal. "CAM", meaning "complementary and alternative medicine", is not as well researched as conventional medicine, which undergoes intense research before release to the public. Funding for research is also sparse making it difficult to do further research for effectiveness of CAM. Most funding for CAM is funded by government agencies. Proposed research for CAM are rejected by most private funding agencies because the results of research are not reliable. The research for CAM has to meet certain standards from research ethics committees, which most CAM researchers find almost impossible to meet. Even with the little research done on it, CAM has not been proven to be effective. Steven Novella, a neurologist at Yale School of Medicine, wrote that government funded studies of integrating alternative medicine techniques into the mainstream are "used to lend an appearance of legitimacy to treatments that are not legitimate." Marcia Angell considered that critics felt that healthcare practices should be classified based solely on scientific evidence, and if a treatment had been rigorously tested and found safe and effective, science-based medicine will adopt it regardless of whether it was considered "alternative" to begin with. It is possible for a method to change categories (proven vs. unproven), based on increased knowledge of its effectiveness or lack thereof. A prominent supporter of this position is George D. Lundberg, former editor of the Journal of the American Medical Association (JAMA). In March 2009 a staff writer for the Washington Post reported that the impending national discussion about broadening access to health care, improving medical practice and saving money was giving a group of scientists an opening to propose shutting down the National Center for Complementary and Alternative Medicine. They quoted one of these scientists, Steven Salzberg, a genome researcher and computational biologist at the University of Maryland, as saying "One of our concerns is that NIH is funding pseudoscience." They noted that the vast majority of studies were based on fundamental misunderstandings of physiology and disease, and had shown little or no effect. Writers such as Carl Sagan, a noted astrophysicist, advocate of scientific skepticism and the author of The Demon-Haunted World: Science as a Candle in the Dark (1996), have lambasted the lack of empirical evidence to support the existence of the putative energy fields on which these therapies are predicated. Sampson has also pointed out that CAM tolerated contradiction without thorough reason and experiment. Barrett has pointed out that there is a policy at the NIH of never saying something doesn't work only that a different version or dose might give different results. Barrett also expressed concern that, just because some "alternatives" have merit, there is the impression that the rest deserve equal consideration and respect even though most are worthless, since they are all classified under the one heading of alternative medicine. It is usually based on religion, tradition, superstition, belief in supernatural energies, pseudoscience, errors in reasoning, propaganda, or fraud. Treatments are not part of the conventional, science-based healthcare system. Research on alternative medicine is frequently of low quality and methodologically flawed. Where alternative treatments have replaced conventional science-based medicine, even with the safest alternative medicines, failure to use or delay in using conventional science-based medicine has caused deaths. Methods may incorporate or base themselves on traditional medicine, folk knowledge, spiritual beliefs, ignorance or misunderstanding of scientific principles, errors in reasoning, or newly conceived approaches claiming to heal. Many alternative medical treatments are not patentable, which may lead to less research funding from the private sector. In addition, in most countries, alternative treatments (in contrast to pharmaceuticals) can be marketed without any proof of efficacy – also a disincentive for manufacturers to fund scientific research. English evolutionary biologist Richard Dawkins, in his 2003 book A Devil's Chaplain, defined alternative medicine as a "set of practices that cannot be tested, refuse to be tested, or consistently fail tests." Dawkins argued that if a technique is demonstrated effective in properly performed trials then it ceases to be alternative and simply becomes medicine. CAM is also often less regulated than conventional medicine. There are ethical concerns about whether people who perform CAM have the proper knowledge to treat patients. CAM is often done by non-physicians who do not operate with the same medical licensing laws which govern conventional medicine, and it is often described as an issue of non-maleficence. According to two writers, Wallace Sampson and K. Butler, marketing is part of the training required in alternative medicine, and propaganda methods in alternative medicine have been traced back to those used by Hitler and Goebels in their promotion of pseudoscience in medicine. In November 2011 Edzard Ernst stated that the "level of misinformation about alternative medicine has now reached the point where it has become dangerous and unethical. So far, alternative medicine has remained an ethics-free zone. It is time to change this." Some commentators have said that special consideration must be given to the issue of conflicts of interest in alternative medicine. Edzard Ernst has said that most researchers into alternative medicine are at risk of "unidirectional bias" because of a generally uncritical belief in their chosen subject. Ernst cites as evidence the phenomenon whereby 100% of a sample of acupuncture trials originating in China had positive conclusions. David Gorski contrasts evidence-based medicine, in which researchers try to disprove hyphotheses, with what he says is the frequent practice in pseudoscience-based research, of striving to confirm pre-existing notions. Harriet Hall writes that there is a contrast between the circumstances of alternative medicine practitioners and disinterested scientists: in the case of acupuncture, for example, an acupuncturist would have "a great deal to lose" if acupuncture were rejected by research; but the disinterested skeptic would not lose anything if its effects were confirmed; rather their change of mind would enhance their skeptical credentials. Research into alternative treatments has been criticized for "...diverting research time, money, and other resources from more fruitful lines of investigation in order to pursue a theory that has no basis in biology." Research methods expert and author of Snake Oil Science, R. Barker Bausell, has stated that "it's become politically correct to investigate nonsense." A commonly cited statistic is that the US National Institute of Health had spent $2.5 billion on investigating alternative treatments prior to 2009, with none being found to be effective. Indian Ayurvedic medicine includes a belief that the spiritual balance of mind influences disease. ^ a b "[A]lternative medicine refers to all treatments that have not been proven effective using scientific methods." ^ a b c d "Complementary and alternative medicine (CAM) is a broad domain of resources that encompasses health systems, modalities, and practices and their accompanying theories and beliefs, other than those intrinsic to the dominant health system of a particular society or culture in a given historical period. CAM includes such resources perceived by their users as associated with positive health outcomes. Boundaries within CAM and between the CAM domain and the domain of the dominant system are not always sharp or fixed." ^ a b "It is time for the scientific community to stop giving alternative medicine a free ride. There cannot be two kinds of medicine – conventional and alternative. There is only medicine that has been adequately tested and medicine that has not, medicine that works and medicine that may or may not work... speculation, and testimonials do not substitute for evidence." ^ a b c "The phrase complementary and alternative medicine is used to describe a group of diverse medical and health care systems, practices, and products that have historic origins outside mainstream medicine. Most of these practices are used together with conventional therapies and therefore have been called complementary to distinguish them from alternative practices, those used as a substitute for standard care. ... Until a decade ago or so, "complementary and alternative medicine" could be defined as practices that are neither taught in medical schools nor reimbursed, but this definition is no longer workable, since medical students increasingly seek and receive some instruction about complementary health practices, and some practices are reimbursed by third-party payers. Another definition, practices that lack an evidence base, is also not useful, since there is a growing body of research on some of these modalities, and some aspects of standard care do not have a strong evidence base." ^ "An alternative medical system is a set of practices based on a philosophy different from Western biomedicine." ^ "CAM is a group of diverse medical and health care systems, practices, and products that are not generally considered part of conventional medicine." ^ The Final Report (2002) of the White House Commission on Complementary and Alternative Medicine Policy states: "The Commissioners believe and have repeatedly stated in this Report that our response should be to hold all systems of health and healing, including conventional and CAM, to the same rigorous standards of good science and health services research. Although the Commissioners support the provision of the most accurate information about the state of the science of all CAM modalities, they believe that it is premature to advocate the wide implementation and reimbursement of CAM modalities that are yet unproven." ^ Mary Ruggie in Chapter 2 of Marginal to Mainstream: Alternative Medicine in America said, "By the mid-1990s, the notion that some alternative therapies could be complementary to conventional medicine began to change the status of...alternative medicine. The 21st century is witnessing yet another terminological innovation, in which CAM and conventional medicine are becoming integrative." ^ As David J. Hufford, Professor and Director at the Doctors Kienle Center for Humanistic Medicine at the Penn State College of Medicine, has argued: "Simply because an herbal remedy comes to be used by physicians does not mean that herbalists cease to practice, or that the practice of the one becomes like that of the other." ^ The BMA used the term non-conventional medicine instead of alternative medicine. ^ The Office for Alternative Medicine, part of the National Institutes of Health, was renamed NCCAM in 1998. ^ "Evidence based medicine is the conscientious, explicit, and judicious use of current best evidence in making decisions about the care of individual patients"; "Evidence based medicine, whose philosophical origins extend back to mid-19th century Paris and earlier, remains a hot topic for clinicians, public health practitioners, purchasers, planners, and the public. British centres for evidence based practice have been established or planned in adult medicine, child health, surgery, pathology, pharmacotherapy, nursing, general practice, and dentistry; the Cochrane Collaboration and Britain's Centre for Review and Dissemination in York are providing systematic reviews of the effects of health care". ^ In his book The Homœopathic Medical Doctrine Samuel Hahnemann the creator of homeopathy wrote: "Observation, reflection, and experience have unfolded to me that the best and true method of cure is founded on the principle, similia similibus curentur. To cure in a mild, prompt, safe, and durable manner, it is necessary to choose in each case a medicine that will excite an affection similar (ὅμοιος πάθος) to that against which it is employed." In 1991 the Senate Appropriations Committee responsible for funding the National Institutes of Health (NIH) declared itself "not satisfied that the conventional medical community as symbolized at the NIH has fully explored the potential that exists in unconventional medical practices. ^ As the medical professor Kenneth M. Ludmerer noted in 2010: "Flexner pointed out that the scientific method of thinking applied to medical practice. By scientific method, he meant testing ideas with well-planned experiments to establish accurate facts. The clinician's diagnosis was equivalent to the scientist's hypothesis: both medical diagnosis and hypothesis required the test of an experiment. Flexner argued that mastery of the scientific method of problem solving was the key for physicians to manage medical uncertainty and to practice in the most cost-effective way." ^ a b c d e f g h i j k l m National Science Board (2002). "Chapter 7: Science and Technology: Public Attitudes and Public Understanding, Section: Belief in Alternative Medicine". Science and Engineering Indicators. Arlington, Virginia: Division of Science Resources Statistics, National Science Foundation, US Government. Archived from the original on 2009-03-12. ^ IOM Report 2005, p. 19. ^ a b c d e f Angell, M.; et al. (1998). "Alternative medicine--The risks of untested and unregulated remedies" (PDF). New England Journal of Medicine. 339 (12): 839–41. CiteSeerX 10.1.1.694.9581. doi:10.1056/NEJM199809173391210. PMID 9738094. ^ a b c d e f g h i j k l m n o p q r s t Sampson, W. (1995). "Antiscience Trends in the Rise of the "Alternative Medicine" Movement". Annals of the New York Academy of Sciences. 775 (1): 188–97. doi:10.1111/j.1749-6632.1996.tb23138.x. PMID 8678416. ^ Kent Heather (1997). "Ignore Growing Patient Interest in Alternative Medicine at Your Peril - MDs Warned". Canadian Medical Association Journal. 157 (10): 1427–28. PMC 1228476. PMID 9371077. ^ Goldrosen MH, Straus SE (2004). "Complementary and alternative medicine: assessing the evidence for immunological benefits" (PDF). Nature Reviews Immunology. 4 (11): 912–21. doi:10.1038/nri1486. PMID 15516970. ^ a b Harrison's Principles of Internal Medicine 2015, p. 1, chpt. 14-E.
^ "Complementary Medicine – Alternative Medical Systems". WebMD. 2014-01-14. Archived from the original on 2015-06-01. Retrieved 2015-06-04. ^ "The Use of Complementary and Alternative Medicine in the United States". National Center for Complementary and Integrative Health. 2015-04-07. Archived from the original on 2015-06-01. Retrieved 2015-06-04. ^ a b c Beyerstein BL (2001). "Alternative medicine and common errors of reasoning". Academic Medicine. 76 (3): 230–37. doi:10.1097/00001888-200103000-00009. PMID 11242572. ^ a b Xiaorui Zhang. "Traditional Medicines: Definitions". WHO Website. Medicines. Archived from the original on 2013-09-27. Retrieved 2012-11-11. Extracted from WHO 2000. ^ a b IOM Report 2005, pp. 16, 175. ^ a b Dasgupta, Amitava; Hammett-Stabler, Catherine A (2011). Herbal Supplements: Efficacy, Toxicity, Interactions with Western Drugs, and Effects on Clinical Laboratory Tests. Hoboken NJ: John Wiley and Sons. pp. 202–05. ISBN 9780470433508. ^ a b c Shapiro, Rose (2010-09-30). Suckers: How Alternative Medicine Makes Fools of Us All. Random House. ISBN 9781409059165. ^ Bombardieri, D.; Easthope, E (October 2000). "Convergence between Orthodox and Alternative Medicine: A Theoretical Elaboration and Empirical Test". Health. 4 (4): 479–94. doi:10.1177/136345930000400404. ^ Shuval, Judith T.; Averbuch, Emma (2012). "Complementary and Alternative Healthcare in Israel". Israel Journal of Health Policy Research. 1 (7): 7. doi:10.1186/2045-4015-1-7. PMC 3424827. PMID 22913721. ^ Freedman, David H. (July–August 2011). "The Triumph of New-Age Medicine". Archived from the original on 10 May 2015. Retrieved 6 June 2015. ^ White House Commission on Complementary and Alternative Medicine Policy (2002). "Chapter 2: Overview of CAM in the United States: Recent History, Current Status, And Prospects for the Future". Final Report. NIH Pub. 03-5411. US Government Printing Office. ISBN 978-0160514760. Archived from the original on 2013-02-15. CS1 maint: Uses authors parameter (link) Chapter 2 archived 2011-08-25. ^ Ernst, E. (1995). "Complementary medicine: Common misconceptions". Journal of the Royal Society of Medicine. 88 (5): 244–47. PMC 1295191. PMID 7636814. Complementary medicine, defined as health care which lies for the most part outside the mainstream of conventional medicine . ^ Joyce, C.R.B. (1994). "Placebo and complementary medicine". The Lancet. 344 (8932): 1279–81. doi:10.1016/S0140-6736(94)90757-9. PMID 7967992. ^ May, J. (2011). "What is integrative health?". BMJ. 343: d4372. doi:10.1136/bmj.d4372. PMID 21750063. ^ Zeller, T.; Muenstedt, K.; Stoll, C.; Schweder, J.; Senf, B.; Ruckhaeberle, E.; Becker, S.; Serve, H.; Huebner, J. (2013-03-01). "Potential interactions of complementary and alternative medicine with cancer therapy in outpatients with gynecological cancer in a comprehensive cancer center". Journal of Cancer Research and Clinical Oncology. 139 (3): 357–65. doi:10.1007/s00432-012-1336-6. ISSN 1432-1335. PMID 23099993. ^ Ben-Arye, Eran; Polliack, Aaron; Schiff, Elad; Tadmor, Tamar; Samuels, Noah (2013-12-01). "Advising patients on the use of non-herbal nutritional supplements during cancer therapy: a need for doctor-patient communication". Journal of Pain and Symptom Management. 46 (6): 887–96. doi:10.1016/j.jpainsymman.2013.02.010. ISSN 1873-6513. PMID 23707384. ^ a b "Complementary and Alternative Medicine in Cancer Treatment (PDQ®): Questions and Answers About Complementary and Alternative Medicine in Cancer Treatment". NCI website. Physician Data Query (PDQ®). National Cancer Institute (NCI), NIH. Archived from the original on 2012-12-15. Retrieved 2012-12-11. ^ a b Borkan, J. (2012). "Complementary alternative health care in Israel and the western world". Israel Journal of Health Policy Research. 1 (1): 8. doi:10.1186/2045-4015-1-8. PMC 3424836. PMID 22913745. ^ a b "What is Complementary and Alternative Medicine (CAM)?". National Center for Complementary and Alternative Medicine. Archived from the original on 2005-12-08. Retrieved 2006-07-11. ^ a b Elsevier Science (2002). "Author interview (Edzard Ernst, editor of The Desktop Guide to Complementary and Alternative Medicine)". Harcourt International. Archived from the original on 2002-03-02. ^ a b Cassileth, B.R. ; et al. (2004). "Complementary and alternative therapies for cancer". The Oncologist. 9 (1): 80–89. doi:10.1634/theoncologist.9-1-80. PMID 14755017. ^ "The short and irreverent e-dition of The Skeptic's Dictionary – part 1 – sCAM – so-called complementary and alternative medicine". skepdic.com. Retrieved 2016-10-15. ^ Tyreman, Stephen (2011-05-01). "Values in complementary and alternative medicine". Medicine, Health Care, and Philosophy. 14 (2): 209–17. doi:10.1007/s11019-010-9297-5. ISSN 1572-8633. PMID 21104324. ^ a b c d e Gorski, D. (2010-08-03). "Credulity about acupuncture infiltrates The New England Journal of Medicine". Science-Based Medicine. Archived from the original on 2013-09-28. ^ a b c Offit, P. (2013). Do You Believe in Magic? : The Sense and Nonsense of Alternative Medicine. HarperCollins. ISBN 978-0062222961. Also published in the UK as Offit, Dr Paul (2013-06-09). Killing Us Softly: The Sense and Nonsense of Alternative Medicine. ISBN 9780007491735. ^ a b Diamond, J. quoted in Dawkins 2003. (p. 36 in 2004 US ed. ISBN 0618335404). ^ a b c Fontanarosa, P.B. ; et al. (1998). "Alternative medicine meets science". JAMA. 280 (18): 1618–19. doi:10.1001/jama.280.18.1618. PMID 9820267. ^ IOM Report 2005, pp. 14–20. ^ Ruggie 2004, p. 20. ^ Sointu 2012, p. 13. ^ Sointu 2012, p. 13. IOM Report 2005, p. 18. ^ Gevitz 1997, pp. 603–33. ^ IOM Report 2005, p. 18. ^ a b Nissen, N.; et al. (2013). "Researching alternative and complementary therapies: Mapping the field". Medical Anthropology. 32 (1): 1–7. doi:10.1080/01459740.2012.718016. PMID 23206171. ^ a b Carroll, R.T. (2011-05-14). "complementary medicine". The Skeptics Dictionary (Online ed.). Archived from the original on |archive-url= requires |archive-date= (help). 2013-09-27. ^ a b c Novella, S. (2010-08-04). "Acupuncture pseudoscience in The New England Journal of Medicine". Science-Based Medicine. Archived from the original on 2013-09-28. ^ IOM Report 2005, p. 14. ^ a b c d e f g h i j k l "Complementary, Alternative, or Integrative Health: What's In a Name?". NCCIH Pub. No. D156. National Center for Complementary and Integrative Health (NCCIH), National Institutes of Health (NIH), US Dept. of Health and Human Services (US HHS). May 2002. Archived from the original on 2005-12-08. Retrieved 2006-07-11. ^ "David J. Hufford". Dept. of Folklore and Folklife, University of Pennsylvania. Archived from the original on 2013-06-26. Retrieved 2013-03-12. ^ Hufford 2004. In Callahan 2004, p. 29. Quoted in IOM Report 2005, p. 17. ^ a b Saks, M. (1992). "Introduction". In Saks, M. (ed.). Alternative Medicine in Britain. Oxford: Clarendon Press. pp. 1–21. ISBN 9780198272786. ^ a b British Medical Association (BMA) 1993, p. 7. ^ Artus, M.; et al. (2007). "The use of CAM and conventional treatments among primary care consulters with chronic musculoskeletal pain". BMC Family Practice. 8 (1): 26. doi:10.1186/1471-2296-8-26. PMC 1878478. PMID 17480212. ^ "David M. Eisenberg, M.D." Health Through Food website. SPE Development US Inc. Archived from the original on 2013-05-29. Retrieved 2013-03-14. ^ Eisenberg et al. 1993. Eisenberg et al. 1998. ^ Sir Walton: Science and Technology Committee 2000, Chapter 1: Introduction. Astin, J.A. ; et al. (1998). "A review of the incorporation of complementary and alternative medicine by mainstream physicians". JAMA Internal Medicine. 158 (21): 2303–10. doi:10.1001/archinte.158.21.2303. PMID 9827781. Pelletier, K.R. ; et al. (1997). "Current trends in the integration and reimbursement of complementary and alternative medicine by managed care, insurance carriers, and hospital providers". American Journal of Health Promotion. 12 (2): 112–22. doi:10.4278/0890-1171-12.2.112. PMID 10174663. ^ IOM Report 2005, pp. 17, 196–252. ^ Salomonsen, L.J. ; et al. (2011). "Use of complementary and alternative medicine at Norwegian and Danish hospitals". BMC Complementary and Alternative Medicine. 11 (1): 4. doi:10.1186/1472-6882-11-4. PMC 3033860. PMID 21244655. ^ a b c d e Wieland, L.S. ; et al. (2011). "Development and classification of an operational definition of complementary and alternative medicine for the Cochrane Collaboration". Alternative Therapies in Health and Medicine. 17 (2): 50–59. PMC 3196853. PMID 21717826. ^ "Complementary and Alternative Medicine Products and their Regulation by the Food and Drug Administration". Office of Policy and Planning, Office of the Commissioner, Food and Drug Administration (FDA), Dept. of Health and Human Services, US Government. 2007. ^ CAM Research Methodology Conference, April 1995 Panel on Definition and Description (1997). "Defining and describing complementary and alternative medicine". Alternative Therapies in Health and Medicine. 3 (2): 49–57. PMID 9061989. ^ "Complementary and Alternative Medicine". UK Dept. of Health website. Archived from the original on 2010-04-07. ^ Zollman et al. 1999. Chan, E.; et al. (2003). "Complementary and alternative therapies in childhood attention and hyperactivity problems". Journal of Developmental & Behavioral Pediatrics. 24 (1): 4–8. doi:10.1097/00004703-200302000-00003. PMID 12584479. Coulson, C.; et al. (2005). "Complementary and alternative medicine utilisation in NHS and private clinic settings: A United Kingdom survey of 400 infertility patients". Journal of Experimental & Clinical Assisted Reproduction. 2 (1): 5. doi:10.1186/1743-1050-2-5. PMC 1084360. PMID 15807886. Archived from the original on 2013-09-28. Roberti di Sarsina, P. (2007). "The social demand for a medicine focused on the person: The contribution of CAM to healthcare and healthgenesis". Evidence-based Complementary and Alternative Medicine. 4 (S1): 45–51. doi:10.1093/ecam/nem094. PMC 2206228. PMID 18227933. Adams, M.; et al. (2007). "The use of complementary and alternative medicine by cancer patients". International Seminars in Surgical Oncology. 4 (1): 10. doi:10.1186/1477-7800-4-10. PMC 1872026. PMID 17470282. ^ a b Hufford, D.J. "CAM and Cultural Diversity: Ethics and Epistemology Converge". In Callahan (2004), pp. 15–35. ^ a b c Kopelman, L. "The Role of Science in Assessing Conventional, Complementary, and Alternative Medicines". In Callahan (2004), pp. 36–53. ^ IOM Report 2005, p. 17. ^ Kong, S.C.; et al. (2005). "The Incidence of self-prescribed oral complementary and alternative medicine use by patients with gastrointestinal diseases". Journal of Clinical Gastroenterology. 39 (2): 138–41. PMID 15681910. ^ Ezzo, J.; Bausell, B.; Moerman, D.E. ; Berman, B.; Hadhazy, V. (Fall 2001). "Reviewing the reviews. How strong is the evidence? How clear are the conclusions?". International Journal of Technology Assessment in Health Care. 17 (4): 457–66. PMID 11758290. ^ IOM Report 2005, pp. 17–18. ^ NHMRC (2013-09-27). "Complementary and alternative medicines". NHMRC Website. Your health. Archived from the original on 2013-09-28. Retrieved 2013-09-30. ^ "ViFABs definition af alternativ behandling". srab.dk. Archived from the original on 2013-09-24. ^ a b Sackett, D.L. ; et al. (1996). "Evidence based medicine: What it is and what it isn't". BMJ. 312 (7023): 71–72. doi:10.1136/bmj.312.7023.71. PMC 2349778. PMID 8555924. ^ "Our work". Nuffield Trust website. The Nuffield Trust for Research and Policy Studies in Health Services. 2016-12-20. Archived from the original on 2013-09-28. ^ Belsey, J.; et al. (May 2009) . What is Evidence-based Medicine (PDF). What is...? Series (2nd ed.). UK: Hayward Medical Communications. Archived from the original (PDF) on 2009-06-08. ^ "Research methods & information tools". Nuffield Trust website. The Nuffield Trust for Research and Policy Studies in Health Services. 2019-01-28. Archived from the original on 2013-09-27. ^ Bardsley, M.; et al. (2011-03-01). "Predictive risk and health care: An overview" (PDF). The Nuffield Trust for Research and Policy Studies in Health Services. Archived from the original (PDF) on 2013-09-28. ^ a b "Cochrane CAM Field". University of Maryland website. Center for Integrative Medicine, School of Medicine, University of Maryland. Archived from the original on 2013-09-28. ^ O'Connor 1995, p. 2. ^ Sarris, J.; et al. (2010). Clinical Naturopathy: An Evidence-based Guide to Practice. Elsevier Health Sciences. ISBN 9780729579261. ^ Jagtenberg T, Evans S, Grant A, Howden I, Lewis M, Singer J (2006). "Evidence-based medicine and naturopathy". J Altern Complement Med. 12 (3): 323–28. doi:10.1089/acm.2006.12.323. PMID 16646733. ^ Ernst E (2001). "Rise in popularity of complementary and alternative medicine: reasons and consequences for vaccination". Vaccine. 20 (Suppl 1): S89–93. doi:10.1016/S0264-410X(01)00290-0. PMID 11587822. ^ "Naturopathic Medicine". American Cancer Society. 1 Nov 2008. Archived from the original on 3 April 2015. Retrieved 20 Nov 2010. ^ Hahnemann 1833, p. iii, 48–49. ^ Ernst, E. (2002). "A systematic review of systematic reviews of homeopathy". British Journal of Clinical Pharmacology. 54 (6): 577–82. doi:10.1046/j.1365-2125.2002.01699.x. PMC 1874503. PMID 12492603. ^ House of Commons: Science and Technology Committee (22 February 2010). Evidence Check 2: Homeopathy (PDF) (Report). HC 45, Fourth Report of Session 2009–2010. London: The Stationery Office. ^ "Homeopathy: An Introduction". Backgrounders. NCCIH. 2013 . Archived from the original on 2013-10-15. ^ Beyerstein, BL; Wallace Sampson (1996). "Traditional Medicine and Pseudoscience in China: A Report of the Second CSICOP Delegation (Part 1)". Skeptical Inquirer. 20 (4). Archived from the original on 2009-10-04. ^ Lu, Gwei-Djen; Needham, Joseph (1980). Celestial Lancets: a History and Rationale of Acupuncture and Moxa. Cambridge and New York: Cambridge University Press. ISBN 9780521215138. ^ Maciocia, Giovanni (1995). Tongue Diagnosis in Chinese Medicine. Seattle: Eastland Press. ISBN 9780939616190. ^ Camillia Matuk (2006). "Seeing the Body: The Divergence of Ancient Chinese and Western Medical Illustration" (PDF). Journal of Biocommunication. 32 (1). ^ Deshpande, Vijaya (January 1987). "Medieval Transmission of Alchemical and Chemical Ideas between India and China" (PDF). Indian Journal of History of Science. 22 (1): 15–28. PMID 11622483. Archived from the original (PDF) on 2015-05-05. ^ Wujastyk 2003, p. xviii. ^ Mishra 2004, p. 8. ^ a b Valiathan, M.S. (2006). "Ayurveda: Putting the house in order" (PDF). Guest Editorial. Current Science. 90 (1): 5–6. ^ "Lead Poisoning Associated with Ayurvedic Medications – Five States, 2000–2003". Morbidity and Mortality Weekly Report. 53 (26): 582–84. 9 July 2004. ^ a b Saper, R.B. ; et al. (2008). "Lead, mercury, and arsenic in US- and Indian-manufactured Ayurvedic medicines sold via the Internet". JAMA. 300 (8): 915–23. doi:10.1001/jama.300.8.915. PMC 2755247. PMID 18728265. ^ Hall, Harriet. "Ayurveda: Ancient Superstition, Not Ancient Wisdom". Skeptical Inquirer. Retrieved 1 February 2018. ^ a b Sagan 1996. ^ De Smet, Peter A.G.M. (December 1997). "The Role of Plant-Derived Drugs and Herbal Medicines in Healthcare". Drugs. 54 (6): 801–40. doi:10.2165/00003495-199754060-00003. PMID 9421691. ^ a b "According to a New Government Survey, 38 Percent of Adults and 12 Percent of Children Use Complementary and Alternative Medicine" (Press release). NIH News. Bethseda, Maryland: National Center for Complementary and Integrative Medicine. 10 December 2008. Retrieved 4 June 2015. ^ Pearce, Alison; Simpson, Neil (March 1998). "A paediatrician's guide to complementary medicine". Current Paediatrics. 8 (1): 62–67. doi:10.1016/S0957-5839(98)80061-4. Retrieved 28 May 2018. ^ "Faith Healing – Making Treatment Decisions". American Cancer Society. June 15, 2009. ^ Aviles, Jennifer M.; Whelan, Sr Ellen; Hernke, Debra A.; Williams, Brent A.; Kenny, Kathleen E.; O'Fallon, W. Michael; Kopecky, Stephen L. (December 2001). "Intercessory Prayer and Cardiovascular Disease Progression in a Coronary Care Unit Population: A Randomized Controlled Trial". Mayo Clinic Proceedings. 76 (12): 1192–98. doi:10.4065/76.12.1192. PMID 11761499. ^ "Energy Medicine: An Overview". Backgrounders. NCCIH. 2005 . Archived from the original on 2016-05-22. ^ Cite error: The named reference ConsumerHealth9th was invoked but never defined (see the help page). ^ a b "The Alternative Fix – Introduction". www.pbs.org. Frontline – PBS. ^ a b c d Smith, T (1983). "Alternative medicine". British Medical Journal (Clinical Research Ed.). 287 (6388): 307–08. doi:10.1136/bmj.287.6388.307. PMC 1548588. PMID 6307462. One of the few growth industries in contemporary Britain is alternative medicine. An apparently endless stream of books, articles, and radio and television programmes urge on the public the virtues of treatments ranging from meditation to drilling a hole in the skull to let in more oxygen. ^ Law, Donald (18 May 1975). "A Guide to Alternative Medicine". Hippocrene Books, New York – via Amazon. ^ Winnick, T.A. (2005). "From quackery to "complementary" medicine: The American medical profession confronts alternative therapies". Social Problems. 52 (1): 38–61. doi:10.1525/sp.2005.52.1.38. JSTOR 10.1525/sp.2005.52.1.38. Winnick, T.A. (2009). "From Quackery to "Complementary" Medicine: The American Medical Profession Confronts Alternative Therapies". In Conrad, P. (ed.). The Sociology of Health and Illness (8th ed.). New York: Worth. pp. 261–77. ISBN 9781429205580. ^ Young, J.H. (1998). "The Development of the Office of Alternative Medicine in the National Institutes of Health, 1991–1996". Bulletin of the History of Medicine. 72 (2): 279–98. doi:10.1353/bhm.1998.0110. PMID 9628052. ^ Flexner, A.; The Carnegie Foundation for the Advancement of Teaching (CFAT) (1910). "Medical Education in the United States and Canada Bulletin Number Four (The Flexner Report)". Boston: D. B. Updike, Merrymount Press. Available from CFAT: The Flexner Report. ^ Ludmerer, K.M. (2010). "Commentary: Understanding the Flexner Report" (PDF). Academic Medicine. 85 (2): 193–96. doi:10.1097/ACM.0b013e3181c8f1e7. PMID 20107341. ^ Bianco, C. (April 2000). "How Becoming a Doctor Works: Medical School Curriculum". HowStuffWorks website. Archived from the original on 2013-10-05. ^ "Stanford's medical curriculum". Stanford University website. Stanford University School of Medicine. Archived from the original on 2013-05-09. ^ "Medical Student Education Program: Curriculum Overview". Yale University website. Yale School of Medicine. Archived from the original on 2013-10-04. ^ Snyderman, R.; et al. (2002). "Integrative medicine: Bringing medicine back to its roots". JAMA Internal Medicine. 162 (4): 395–97. doi:10.1001/archinte.162.4.395. PMID 11863470. ^ Berman, B.M. (2001). "Complementary medicine and medical education". BMJ. 322 (7279): 121–32. doi:10.1136/bmj.322.7279.121. PMC 1119400. PMID 11159555. ^ "Center for Integrative Medicine". University of Maryland website. University of Maryland School of Medicine. Archived from the original on 2010-03-23. ^ a b "Doctor of medicine profession (MD)". MedlinePlus. US National Library of Medicine, NIH. 2011-02-03. Archived from the original on 2013-01-27. Retrieved 2012-12-20. ^ a b Kent, H. (1997). "Ignore growing patient interest in alternative medicine at your peril - MDs warned". Canadian Medical Association Journal. 157 (10): 1427–28. PMC 1228476. PMID 9371077. ^ a b Goldrosen, M.H. ; et al. (2004). "Complementary and alternative medicine: assessing the evidence for immunological benefits". Perspective. Nature Reviews Immunology. 4 (11): 912–21. doi:10.1038/nri1486. PMID 15516970. ^ Sarris, J. (2012). "Current challenges in appraising complementary medicine evidence". Medical Journal of Australia. 196 (5): 310–11. doi:10.5694/mja11.10751. PMID 22432660. ^ Alcock, J. (1999). "Alternative medicine and the psychology of belief". Scientific Review of Alternative Medicine. 3 (2). ^ Ernst, E. "The HealthWatch Award 2005: Prof. Edzard Ernst: Complementary medicine: The good the bad and the ugly". UK: HealthWatch. Archived from the original on 2013-10-16. ^ Ernst, E. (2011). "How Much of CAM Is Based on Research Evidence?". Evidence-based Complementary and Alternative Medicine. 2011: 676490. doi:10.1093/ecam/nep044. PMC 3136881. PMID 19465405. ^ "Alternative Medicine: Think yourself better". The Economist. 2011-05-19. pp. 83–84. Archived from the original on 2011-05-22. ^ Ernst, E. (2008). "Placebo and other Non-specific Effects". In Ernst, E. (ed.). Healing, Hype, or Harm? A Critical Analysis of Complementary or Alternative Medicine. Imprint Academic, Societas. ISBN 9781845401184. ^ Katz, D.L. ; et al. (2003). "The evidence base for complementary and alternative medicine: Methods of evidence mapping with application to CAM". Alternative Therapies in Health and Medicine. 9 (4): 22–30. PMID 12868249. ^ IOM Report 2005, pp. 135–36. ^ Bodeker, G.; et al. (2002). "A public health agenda for traditional, complementary, and alternative medicine". American Journal of Public Health. 92 (10): 1582–91. doi:10.2105/AJPH.92.10.1582. PMC 3221447. PMID 12356597. ^ a b Vickers, A. (2004). "Alternative cancer cures: 'Unproven' or 'disproven'?". CA – A Cancer Journal for Clinicians. 54 (2): 110–18. CiteSeerX 10.1.1.521.2180. doi:10.3322/canjclin.54.2.110. PMID 15061600. ^ a b c d e Hróbjartsson A, Gøtzsche PC (January 2010). Hróbjartsson A (ed.). "Placebo interventions for all clinical conditions" (PDF). The Cochrane Database of Systematic Reviews. 106 (1): CD003974. doi:10.1002/14651858.CD003974.pub3. PMID 20091554. ^ Cite error: The named reference beecher1955 was invoked but never defined (see the help page). ^ a b c d e Kienle GS, Kiene H (December 1997). "The powerful placebo effect: fact or fiction?". Journal of Clinical Epidemiology. 50 (12): 1311–8. doi:10.1016/s0895-4356(97)00203-5. PMID 9449934. ^ a b Cite error: The named reference :0 was invoked but never defined (see the help page). ^ a b c d e "$2.5 billion spent, no alternative cures found". Alternative Medicine. NBCNews.com. Associated Press. 2009-06-10. Archived from the original on 2009-06-13. ^ Sobel, D.S. (2000). "Chapter 28: The Cost-effectiveness of Mind-body Medicine Interventions". In Mayer, E.A. ; Saper, C.B. (eds.). Progress in Brain Research. Progress in Brain Research. Volume 122. pp. 393–412. doi:10.1016/S0079-6123(08)62153-6. ISBN 9780444500496. PMID 10737073. ^ a b c d e f Beyerstein, B.L. (1999). "Psychology and 'alternative medicine' social and judgmental biases that make inert treatments seem to work". Scientific Review of Alternative Medicine. 3 (2). Archived from the original on 2011-10-12. Retrieved 2008-07-07. ^ "Complementary therapies: The big con?". The Independent. London. 2008-04-22. Archived from the original on 2010-04-17. Retrieved 2010-04-23. ^ a b Weber, D.O. (1998). "Complementary and alternative medicine considering the alternatives". Physician Executive. 24 (6): 6–14. PMID 10351720. ^ a b c d e Beyerstein, B.L. (2001). "Alternative medicine and common errors of reasoning". Academic Medicine. 76 (3): 230–37. doi:10.1097/00001888-200103000-00009. PMID 11242572. ^ a b c d Barnes, P.M.; Powell-Griner, E.; McFann, K.; Nahin, R.L. (2004). "Complementary and alternative medicine use among adults: United States, 2002" (PDF). Advance Data from Vital and Health Statistics (343): 1–19. PMID 15188733. ^ Martin, Hélène; Debons, Jérôme (2015). CAM and conventional medicine in Switzerland : divided in theory, united in practice. In N. K. Gale & J. V. McHale, Routledge Handbook of Complementary and Alternative Medicine. Perspectives from social science and law. London and New York: Routledge. pp. 271–91. ^ "Traditional medicine". WHO. 2003. Archived from the original on 2008-07-28. Retrieved 2008-03-06. ^ Horrobin, D.F. (1986). "Glittering prizes for research support". Nature. 324 (6094): 221. Bibcode:1986Natur.324..221H. doi:10.1038/324221a0. ^ Salzberg, Steven. "$142 Million For Quack Medicine Buried Inside The New 2018 Budget". Forbes. Retrieved 2019-02-14. ^ "NCCIH Funding: Appropriations History". NCCIH. 2008-01-09. Archived from the original on 2009-06-11. Retrieved 2008-04-02. ^ "NCCIH Strategic Plan 2016-2021, or: Let's try to do some real science for a change". Science-Based Medicine. 2016-04-04. Retrieved 2019-02-14. ^ Atwood, K.C., IV (September–October 2003). "The Ongoing Problem with the National Center for Complementary and Alternative Medicine". Skeptical Inquirer. 27.5. Archived from the original on 2009-11-16. Retrieved 2009-11-18. ^ Green S (2001). "Stated goals and grants of the Office of Alternative Medicine/National Center for Complementary and Alternative Medicine". Scientific Review of Alternative Medicine. 5 (4): 205–07. ^ "Annual Report on CAM 2011" (PDF). ^ Coulter, I.D. ; et al. (2004). "The rise and rise of complementary and alternative medicine: A sociological perspective". Medical Journal of Australia. 180 (11): 587–89. PMID 15174992. ^ Merrick, Janna (June 2003). "Spiritual Healing, Sick Kids and the Law: Inequities in the American Healthcare System". American Journal of Law & Medicine. 29 (2): 269–99. ^ "Definitions of Child Abuse and Neglect" (PDF). Child Welfare Information Gateway. 2007. Archived from the original (PDF) on 11 October 2007. Retrieved 2009-02-27. ^ a b c Eisenberg, D.M. ; et al. (1998). "Trends in alternative medicine use in the United States, 1990–1997: Results of a follow-up national survey". JAMA. 280 (18): 1569–75. doi:10.1001/jama.280.18.1569. PMID 9820257. ^ Warner, J. (2006-07-20). "Alternative Medicine Goes Mainstream". WebMD. CBS News. Archived from the original on 2013-09-28. Retrieved 2013-03-11. ^ a b "Latest Survey Shows More Hospitals Offering Complementary and Alternative Medicine Services" (Press release). American Hospital Association. 2008-09-15. Archived from the original on 2012-09-02. ^ Barnes, P.M.; Bloom, B.; Nahin, R.L. (2008). "Complementary and alternative medicine use among adults and children: United States, 2007". National Health Statistics Reports (12): 1–23. PMID 19361005. ^ Sir Walton: Science and Technology Committee 2000. ^ "Complementary and alternative medicine (CAM)". NHS Careers website. National Health Service in England (NHS), UK Dept. of Health. Archived from the original on 2013-04-03. Retrieved 2013-03-11. ^ Kellehear, A. (2003). "Complementary medicine: Is it more acceptable in palliative care practice?". Medical Journal of Australia. 179 (6 Supplement): S46–48. PMID 12964939. ^ Menefee, L.A.; Monti, D.A. (2005). "Nonpharmacologic and complementary approaches to cancer pain management". The Journal of the American Osteopathic Association. 105 (5 Supplement): S15–20. PMID 16368903. Archived from the original on 2008-12-01. ^ Cassileth, B.R. (1996). "Alternative and complementary cancer treatments". The Oncologist. 1 (3): 173–79. CiteSeerX 10.1.1.493.434. PMID 10387984. ^ Marty, A.T. (1999). "The Complete German Commission E Monographs: Therapeutic Guide to Herbal Medicines". Books, Journals, New Media. JAMA. 281 (19): 1852–53. doi:10.1001/jama.281.19.1852-JBK0519-2-1. ^ a b WHO 2005. ^ "Medication Health Fraud". fda.gov. ^ "Alternative Medicine Fraud". fda.gov. ^ Niggemann, B.; Grüber, C. (22 February 2003). "Side-effects of complementary and alternative medicine". Allergy. 58 (8): 707–16. doi:10.1034/j.1398-9995.2003.00219.x. PMID 12859546. ^ Colquhoun, D. (2012). "Regulation of alternative medicine ‐ Why it doesn't work" (PDF). Scottish Universities Medical Journal. EPub. 1 (16): 1–9. ^ Connelly, P. (2012). "The ethics of acupuncture" (PDF). Scottish Universities Medical Journal. 1 (2): 165–69. ^ Malcolm, R. (2012). "Small but intriguing – The unfolding story of homeopathic medicine" (PDF). Scottish Universities Medical Journal. EPub. 1 (15): 1–7. ^ Hills, B. (2011-09-23) . "Fake healers: Why Australia's $1 billion-a-year alternative medicine industry is ineffective and out of control". BenHills.com. Archived from the original on 2012-03-15. Retrieved 2008-03-06. ^ Swan, N. (2000-10-02). "Alternative Medicine – Part Three". The Health Report. Australian Broadcasting Corporation. Radio National. Archived from the original on 2008-03-06. Retrieved 2008-03-06. ^ Roozbeh, J; Hashempur, M. H.; Heydari, M (Nov 2013). "Use of herbal remedies among patients undergoing hemodialysis". Iran J Kidney Dis. 7 (6): 492–95. PMID 24241097. ^ Del Prete, A; Scalera, A; Iadevaia, M. D.; Miranda, A; Zulli, C; Gaeta, L; Tuccillo, C; Federico, A; Loguercio, C (2012). "Herbal products: benefits, limits, and applications in chronic liver disease". Evid Based Complement Alternat Med. 2012: 1–19. doi:10.1155/2012/837939. PMC 3443820. PMID 22991573. ^ a b Stehlin, I. (December 1996). "Homeopathy: Real medicine or empty promises?". FDA Consumer Magazine. Archived from the original on 2007-10-12. ^ Navarro, V.J. ; et al. (2006). "Drug-related hepatotoxicity". New England Journal of Medicine. 354 (7): 731–39. doi:10.1056/NEJMra052270. PMID 16481640. ^ a b Lilienfeld, S.O. (2002). "Our raison d'ĕtre". Scientific Review of Mental Health Practice. 1 (1). Archived from the original on 2007-07-26. Retrieved 2008-01-28. ^ a b Hughes, D. (2010-12-23). "Alternative remedies 'dangerous' for kids says report". BBC News. Archived from the original on 2010-12-24. ^ a b c d e f g Ernst, E.; et al. (2004). "Ethical problems arising in evidence based complementary and alternative medicine". Journal of Medical Ethics. 30 (2): 156–59. doi:10.1136/jme.2003.007021. PMC 1733834. PMID 15082809. Retrieved 2013-11-04. ^ Ernst, E. (1999). "Funding research into complementary medicine: The situation in Britain". Complementary Therapies in Medicine. 7 (4): 250–53. doi:10.1016/S0965-2299(99)80011-9. PMID 10709311. ^ Ernst, .E; Pittler, M.H. ; Stevinson, C.; White, A., eds. (2001). The Desktop Guide to Complementary and Alternative Medicine. Edinburgh: Mosby. ISBN 9780723432074. OCLC 492760852. ^ a b Brown, D. (2009-03-17). "Scientists speak out against federal funds for research on alternative medicine". The Washington Post. Retrieved 2010-04-23. ^ Cassileth, B.R. (1999). "Evaluating complementary and alternative therapies for cancer patients". CA – A Cancer Journal for Clinicians. 49 (6): 362–75. doi:10.3322/canjclin.49.6.362. PMID 11198952. ^ Barrett, S. (2004-02-10). "Be Wary of "Alternative" Health Methods". Quackwatch. Archived from the original on 2008-05-09. Retrieved 2008-03-03. ^ "NCAHF Mission Statement". National Council Against Health Fraud (NCAHF) website. 2009-11-30. Retrieved 2013-03-11. ^ Steele, F.R. (1996). "Book review: The Demon-Haunted World: Science as a Candle in the Dark by Carl Sagan". Nature Medicine. 2 (9): 1042. doi:10.1038/nm0996-1042. Hines, T. (2003). Pseudoscience and the Paranormal (2nd ed.). Amherst, New York: Prometheus Books. ISBN 9781573929790. Sampson, W. (2001). Grollman, A.P. (ed.). "The need for educational reform in teaching about alternative therapies". Academic Medicine. 76 (3): 248–50. doi:10.1097/00001888-200103000-00011. PMID 11242574. ^ IOM Report 2005, pp. 17–19. ^ Zollman, C.; et al. (1999). "What is complementary medicine?". ABC of complementary medicine. BMJ. 319 (7211): 693–96. doi:10.1136/bmj.319.7211.693. PMC 1116545. PMID 10480829. ^ IOM Report 2005, p. 146. ^ Acharya, D.; et al. (2008). Indigenous Herbal Medicines: Tribal Formulations and Traditional Herbal Practices. Jaipur, India: Aavishkar Publishers. p. 440. ISBN 9788179102527. ^ Fonfa, Anne E. (September 1, 2017). "Patient Perspectives: Barriers to Complementary and Alternative Medicine Therapies Create Problems for Patients and Survivors". Integrative Cancer Therapies (September 2007): 297–300. doi:10.1177/1534735407306598. Retrieved April 2, 2019. ^ Ernst, E. (2005). "The efficacy of herbal medicine -- An overview". Fundamental & Clinical Pharmacology. 19 (4): 405–09. doi:10.1111/j.1472-8206.2005.00335.x. PMID 16011726. ^ Dawkins, R. (2003). Menon, L. (ed.). A Devil's Chaplain: Selected Essays. London: Weidenfeld & Nicolson. ISBN 9780753817506. (p. 180 in 2004 US ed. ISBN 0618335404). ^ Holloway, R. (2003-02-14). "A callous view". Books. The Guardian. London. Archived from the original on 2010-04-11. Retrieved 2010-04-23. ^ Ernst, E. (1996). "The ethics of complementary medicine". Journal of Medical Ethics. 22 (4): 197–98. doi:10.1136/jme.22.4.197. PMC 1376996. PMID 8863142. ^ Butler, K.; et al. (1992). A Consumer's Guide to "Alternative Medicine": A Close Look at Homeopathy, Acupuncture, Faith-healing and Other Unconventional Treatments. Consumer Health Library. Buffalo, New York: Prometheus. ISBN 9780879757335. ^ Ernst, E. (2011-11-08). "Alternative medicine remains an ethics-free zone". The Guardian. London. Archived from the original on 2013-01-28. ^ a b Ernst E (2011). "Conflicts of Interest in Alternative Medicine". Skeptical Inquirer. 35 (4). ^ Gorski D (16 November 2009). "Conflicts of interest in science-based medicine". Science-Based Medicine. ^ Hall HA (27 April 2011). "Conflicts of interest". Science-Based Medicine. Cite error: A list-defined reference named "Berman2010" is not used in the content (see the help page). Cite error: A list-defined reference named "Kerman2010" is not used in the content (see the help page). Bivins, R. (2007). Alternative Medicine? A History. Oxford University Press. ISBN 9780199218875. Callahan, D., ed. (2004). The Role of Complementary and Alternative Medicine: Accommodating Pluralism. Washington, D.C.: Georgetown University Press. ISBN 9781589014640. Cohen, Michael H. (1998). Complementary & Alternative Medicine: Legal Boundaries and Regulatory Perspectives. Baltimore: Johns Hopkins University Press. ISBN 9780801856891. Gevitz, N. (1997) . "Chapter 28: Unorthodox Medical Theories". In Bynum, W.F. ; Porter, R.S. (eds.). Companion Encyclopedia of the History of Medicine. Vol. 1. New York & London: Routledge. ISBN 9780415164191. Hahnemann, S. (1833). The Homœopathic Medical Doctrine, or "Organon of the Healing Art". Translation by Devrient, C.H. Annotated by Stratten, S. Dublin: W.F. Wakeman. Kasper, Dennis L; Fauci, Anthony S.; Hauser, Stephen L.; Longo, Dan L.; Jameson, J. Larry; Loscalzo, Joseph (2015). Harrison's Principles of Internal Medicine (19th ed.). New York: McGraw Hill Education. ISBN 9780071802154. Mishra, Lakshmi Chandra (2004). Scientific Basis for Ayurvedic Therapies. Boca Raton: CRC Press. ISBN 978-0849313660. O'Connor, Bonnie Blair (1995). Healing Traditions: Alternative Medicine and the Health Professions. Philadelphia: University of Pennsylvania Press. ISBN 9780812213980. Ruggie, M. (2004). Marginal to Mainstream: Alternative Medicine in America. Cambridge University Press. ISBN 9780521834292. Sagan, C. (1996). The Demon-Haunted World: Science As a Candle in the Dark. New York: Random House. ISBN 9780394535128. Saks, M. (2003). Orthodox and Alternative Medicine: Politics, Professionalization and Health Care. Sage Publications. ISBN 9781446265369. Sointu, E. (2012). Theorizing Complementary and Alternative Medicines: Wellbeing, Self, Gender, Class. Basingstoke, England: Palgrave Macmillan. ISBN 9780230309319. Taylor, Kim (2005). Chinese Medicine in Early Communist China, 1945–63: a Medicine of Revolution. Needham Research Institute Studies. London and New York: RoutledgeCurzon. ISBN 978-0415345125. Wujastyk, D., ed. (2003). The Roots of Ayurveda: Selections from Sanskrit Medical Writings. Translated by D. Wujastyk. London and New York: Penguin Books. ISBN 978-0140448245. Bausell, R.B (2007). Snake oil science : the truth about complementary and alternative medicine. Oxford University Press. ISBN 9780195313680. Benedetti, F.; et al. (2003). "Open versus hidden medical treatments: The patient's knowledge about a therapy affects the therapy outcome". Prevention & Treatment. 6 (1). doi:10.1037/1522-3736.6.1.61a. Dawkins, R. (2001). "Foreword". In Diamond, J. (ed.). Snake Oil and Other Preoccupations. London: Vintage. ISBN 9780099428336. Reprinted in Dawkins 2003. Downing AM, Hunter DG (2003). "Validating clinical reasoning: A question of perspective, but whose perspective?". Manual Therapy. 8 (2): 117–19. doi:10.1016/S1356-689X(02)00077-2. PMID 12890440. Eisenberg DM (July 1997). "Advising patients who seek alternative medical therapies". Annals of Internal Medicine. 127 (1): 61–69. doi:10.7326/0003-4819-127-1-199707010-00010. PMID 9214254. Gunn IP (December 1998). "A critique of Michael L. Millenson's book, Demanding Medical Excellence: Doctors and Accountability in the Information Age, and its Relevance to CRNAs and Nursing". AANA Journal. 66 (6): 575–82. ISSN 0094-6354. PMID 10488264. Hand, W.D. (1980). "Folk Magical Medicine and Symbolism in the West". Magical Medicine. Berkeley: University of California Press. pp. 305–19. ISBN 9780520041295. OCLC 6420468. Illich, I. (1976). Limits to Medicine: Medical Nemesis: The Expropriation of Health. Penguin. ISBN 9780140220094. OCLC 4134656. Mayo Clinic (2007). Mayo Clinic Book of Alternative Medicine: The New Approach to Using the Best of Natural Therapies and Conventional Medicine. Parsippany, New Jersey: Time Home Entertainment. ISBN 9781933405926. Stevens, P., Jr. (November–December 2001). "Magical thinking in complementary and alternative medicine". Skeptical Inquirer. Planer, F.E. (1988). Superstition (Rev. ed.). Buffalo, New York: Prometheus Books. ISBN 9780879754945. OCLC 18616238. Rosenfeld, A. (c. 2000). "Where Do Americans Go for Healthcare?". Cleveland, Ohio: Case Western Reserve University. Retrieved 2010-09-23. Snyder, Mariah; Lindquist, Ruth (May 2001). "Issues in Complementary Therapies: How We Got to Where We Are". Online Journal of Issues in Nursing. 6 (2). Tonelli MR (2001). "The limits of evidence-based medicine". Respiratory Care. 46 (12): 1435–40, discussion 1440–1. PMID 11728302. Trivieri, L. Jr. (2002). Anderson, J.W. (ed.). Alternative Medicine: The Definitive Guide. Berkeley: Ten Speed Press. ISBN 9781587611414. Wisneski, L.A.; et al. (2005). The scientific basis of integrative medicine. CRC Press. ISBN 9780849320811. Zalewski, Z. (1999). "Importance of philosophy of science to the history of medical thinking". CMJ. 40 (1): 8–13. Archived from the original on 2004-02-06. General Guidelines for Methodologies on Research and Evaluation of Traditional Medicine (PDF). WHO/EDM/TRM/2001.1. Geneva: World Health Organization (WHO). 2000. This document is not a formal publication of the WHO. The views expressed in documents by named authors are solely the responsibility of those authors. WHO Guidelines on Basic Training and Safety in Chiropractic (PDF). Geneva: WHO. 2005. ISBN 978-9241593717.
WHO Kobe Centre; Bodeker, G.; et al. (2005). WHO Global Atlas of Traditional, Complementary and Alternative Medicine. WHO. ISBN 9789241562867. Summary.